These are my speed skates. They haven't seen much action in the past year or so, but I do know how to use them. Learning how to speed skate on the short track was way more challenging than I anticipated, and took me far out of my comfort zone. 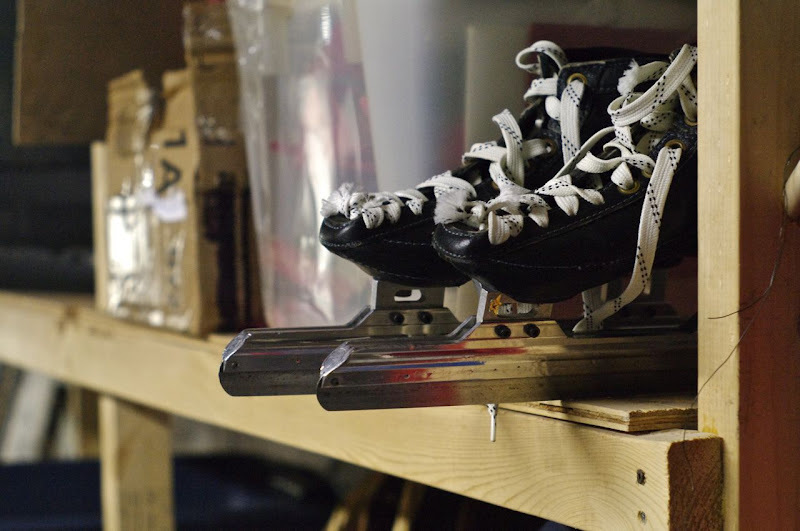 I had assumed that knowing how to get around the ice on figure skates & hockey skates would be enable me to just strap these guys on and zip around the rink. Was I wrong! Not tripping on the long, straight blades, balancing on the edges, propelling myself forward, turning without falling -- all had to be learned as if for the first time. But before too long, I was moving with relative ease, if not blinding speed, around the track. As my skating improved, I got faster, and crouched lower. Sometimes, I even passed other skaters, while whipping around the turns and balancing on one skate at a time. Every so often, my blades would lose their grip, and then I'd be down, sliding into the mats that line the walls of the rink. Once, I managed to skim the ice with my fingertips as I pivoted through the turn, and I imagined that I must have looked just like an Olympian! Watching those athletes this past week makes me think I should get back out there. Of course, I have several excuses: the rink is far away, practice is held late at night during the week, I'm not fond of skinsuits... But I did enjoy it. Maybe I'll try a few turns on the "home ice" this weekend. This weekend, on those skates . . . I better get out there and groom the ice lest we have a scenario like the Olympic long track speed skating--amateurs. You are a woman of many talents!! Do you think Mr. CM would be kind enough to photograph your return from speed skating retirement so we, too, can bask in your glory? I snapped the photos . . . It's up to the management to post them.